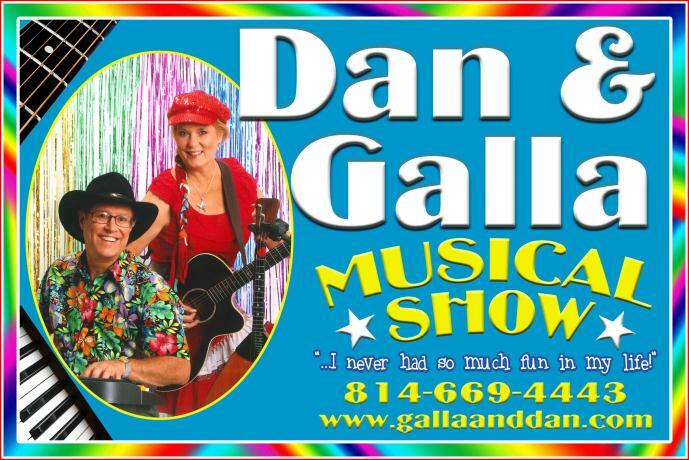 Dan & Galla have become a favorite at fairs throughout Pennsylvania. A little over 10 years ago, Dan & Galla were invited to the PA PSACF convention. Fresh from playing cruise ships, Atlantic City, Lake Placid and traveling across the country in a 5-piece show band, they quickly fell in love with the fair circuit and have been going strong ever since. With Dan & Galla, each show is fresh and unique, with “feel-good” music from the ‘50s & ‘60s, “oldies”, country, patriotic, Russian and lots more. They are “so much fun”. Their show plays well on both large and small stages. They also play for fair queen pageants, harness racing, Senior Citizen and Kids’ Days. They emcee talent, pet and dance contests. They carry a number of tambourines, shakers, flags and for the younger set, many hula hoops and the ever popular limbo. bubble-gum blowing contest to your fair!